The scaffolding around the tower of Chester Cathedral is a symbol of the problems increasingly facing Britain's cathedrals. It has been there for three years while repair work that was supposed to have been carried out on the vulnerable sandstone has been frozen because of a cash crisis. The delayed repairs have had no impact on the pattern of worship in the cathedral that stretches back more than 1,000 years. That sense of timelessness was very evident as the cathedral's lay clerks sang the office of evensong on a recent chill winter's evening before a small, loyal congregation. But the cathedral authorities say it is undoubtedly storing up problems for the future. To help balance the budget, Chester has already had to make three staff redundant over the past year - a stonemason, an electrician and a musician. One of the factors that has led to the rising financial difficulties is a fall in the number of visitors. 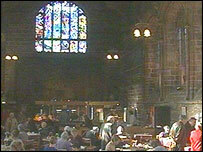 The cathedral used to have around 1.2m visitors a year - but that was up to the September 11 attacks in the US. Since then the smaller number of American tourists visiting the region has prompted a drop of around 40% in the cathedral's visitor numbers. Chester's problems are mirrored at many other cathedrals. 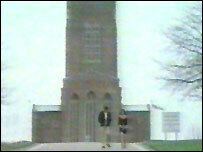 Guildford Cathedral may have a spectacular hilltop location but one of the drawbacks is that this leaves it more isolated than many cathedrals and it has hardly established itself as part of the tourist circuit - it has around 65,000 visitors a year. It also has the problem that it does not have history on its side. Consecrated only 43 years ago, the building has not yet acquired the rustic charms that usually go with age. What it does have is some of the problems of buildings of its own age, such as asbestos in the roof. And it has all the bills associated with running a large cathedral that, like others, has to meet today's standards on health and safety and access for the disabled. There has also been a recent move which could have had the effect of cutting the funding cathedrals receive from the Church of England's central authorities, though it has been shelved for now. However, the Association of English Cathedrals says that if funding were reduced, some cathedrals would be under such pressure that they would no longer be able to remain open all the time. The place of cathedrals in the nation's heritage is obvious. But the clergy responsible for them argues that they also provide a unique atmosphere. They host events of celebration and mourning that could not be housed anywhere else. Yet you can be as anonymous as you wish in a cathedral, using it at any time as a quiet place to pray or reflect. And no other European nation's cathedrals keep alive the tradition of daily sung services on anything like the scale of the English cathedrals. It is a time that calls for innovative ways of raising money, the cathedrals admit. Chester's visitors donate 29p a head on average; £3 is needed. Recognising that people tend to carry less cash these days, it now has facilities for credit card donations. But Guildford has already tried that. Its latest fundraising initiative? It has just had a Bollywood film crew in, using the cathedral to shoot scenes for a new movie.